Beeswax is harvested from the comb of the hardworking honeybee. Beeswax is a miraculous creation. It is wonderfully aromatic, forms a moisture-retaining layer on the skin, is stable with time, and antimicrobial. It is most commonly used to make candles. As a candle wax , it is smokeless and slow burning. It can be mixed with other natural oils and waxes to change burn characteristics. In skin care products, beeswax is an effective humectant and, when used with borax, is a moderate emulsifier. It is fantastic in base in balms and salves. 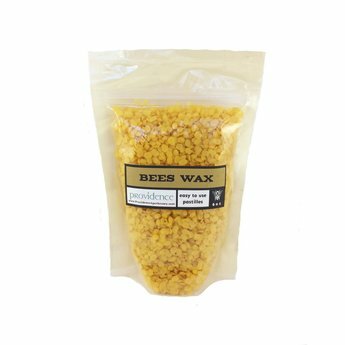 Beeswax stores very well with time, so much so that useable beeswax was found in Egyptian tombs over 5000 years old! Store beeswax in a cool dark area and it should store indefinitely. When melting beeswax, always use a water bath by placing the container of wax - probably a small saucepan - inside a larger pan of water. Never place a pan of wax directly on a hot plate or gas ring. Beeswax can easily become damaged by localized overheating and if it ignites, can burn more ferociously than any chip pan fire. Beeswax does not boil - it just gets hotter and hotter until it ignites.